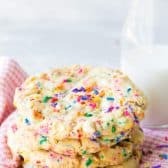 Soft and chewy sugar cookies liberally dotted with white chocolate chips and candy sprinkles. Such a fun cookie treat. Cream the softened butter for about 1 minute on medium speed in a large bowl, with a paddle attachment or hand mixer, until nice and smooth. Add sugar and continue to cream until fluffy. Add egg, continuing to mix. Then add vanilla. Scrape down sides of the mixing bowl, and set aside. In a separate bowl, whisk together flour, baking powder, baking soda, and cream of tartar. Return to the bowl with butter and sugar mixture, and turn the mixer on to a low speed, then slowly add the flour mixture. Once combined, turn off mixer, and fold in sprinkles and chocolate chips by hand. Scoop the dough into 2 Tablespoon sized balls, and place 6 to a parchment lined baking sheet. You should get about 15-16 cookies. Chill the baking sheets with the dough for at least an hour to prevent too much spreading in the oven. When ready to bake, Preheat oven to 350F. Bake for 12-13 minutes. Cool on the cookie sheets for 2-4 minutes before moving to a wire rack to cool completely. The cookies will appear very soft once cooled Enjoy!